Review: Segway miniPRO from NineBot - Should You Buy It? Believe it or not, with the rising popularity of Hoverboards over the past few years… they are illegal (for public use) in New York City – meaning you have to use them on your own private property. Reports state they are also illegal in the whole of the UK. Which is a shame, considering how much have a blast they are to ride (and even to look at). True, when Hoverboards were introduced to the public in 2015, there was a staggering amount of recalls. Board batteries exploded and injured hundreds to thousands of people. Since then, Underwriters Laboratories formed a series of tests (which have become industry-standard) specifically running Hoverboard batteries—and every component therewithin—through the ringer to ensure the safety of riders on Hoverboards. These tests are to ensure that the batteries, motherboards, and products themselves can withstand severe electrical and fire-inductive conditions. Segway, however, has become a staple of safety and high-quality around the world. What separates the Segway miniPRO from industry-standard Hoverboards (indeed, even Segway’s own Hoverboards) is that the miniPRO’s foot platform feels substantially safer. You’re simply able to get “better” footing than traditional Hoverboards provide. A stark contrast is the classic Segway’s waist-high (sometimes chest-high when it came to shorter people such as myself) handlebars were shrunken down to knee height (or waist-high for the shorter people). This steering bar makes riding Segway’s segways more fun this time around. The steering bar also makes control less of an issue – since it’s literally a handlebar. As opposed to Hoverboards, which take quite a bit of motor memory skills to ride properly (and safely), the Segway miniPRO’s learning curve takes virtually no time at all to “master.” You simply hold onto the bar and lean left or right to turn. (Remember Razor’s foot scooters? The same steering mechanism applies.) (Plus, the bar is knee-padded to protect your legs from accidental impacts.) This bar makes it more easily controllable than Hoverboards and electric scooters (which rely on foot-placement instead of leaning). Whereas previous Segways carried a maximum of 260 lbs. (~118 kgs. 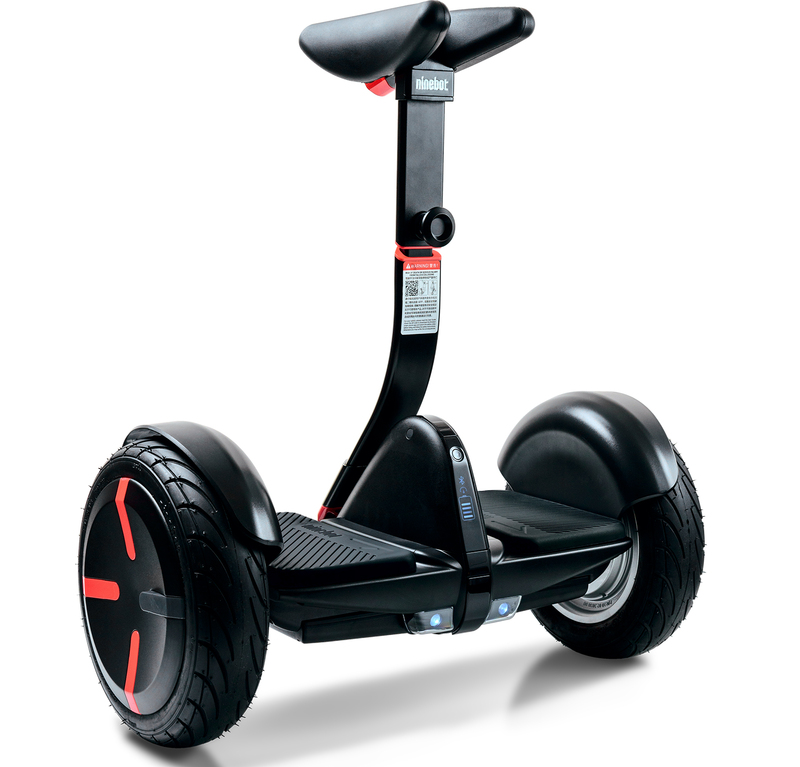 ), the Segway miniPRO carries up to a reduced amount of 220 lbs. (100 kgs.) Even though it carries a whopping 220 lbs. (and is rather “large”), it’s worth knowing that—even with the 800W motor (which makes it easy for the miniPRO to roll over slight humps and semi-steep slopes)—the device can be easily stored in a car trunk without hassle. It’s worth knowing that, when you take this thing out for a ride – it won’t go any faster than 4 mph (~6 km/h) for the first kilometre (~0.62 miles). However, it’s top speed is a whopping 10 mph (16 km/h) – which is considerably fast when it comes to Segways and Hoverboards. However, it’s virtually impossible to reach these (admittedly dangerous) speeds as the device is designed to slow down, by ever so discreetly leaning backwards, thereby preventing any accidental injuries from happening. In addition to automatically slowing down, the device also distinctly beeps and notifies you (via the LED screen situated in the middle, in front of you) that you’re going “too fast”. While this automatic override may be a downer for speed freaks, it’s a vital safety mechanism for any children who may have a tendency for fast, dangerous speeds. The “remote control” issues aren’t a problem for me, personally, as I love manually steering. What brings the miniPRO back into the “plusses” is the fact that—on a single battery charge—you can travel up to 14 miles (22 km). 14 miles is nothing to sneeze at or joke about: that is a far distance to travel on one single charge. Another aspect where the miniPRO shines is its customisable LED taillights. While implementing LED headlights and taillights (to make riders more visible at night) has become standard practice in this market, not a lot of manufacturers installed customisable tail-lights which can be fully changed to suit your riding style.